Dyscover provides a vital service to disabled people in Surrey and surrounding areas, yet we rely entirely on donations and grants to operate. We are always happy to show you how your money is being spent and how it benefits our members. 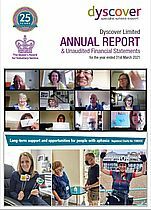 Please click on the link opposite to download a copy of our latest Annual Report. We will also appreciate any help with our ‘Wish List’ please click here. Why not become a Champion and give regularly to help us develop services and a wider programme of activities? By giving monthly, quarterly or annually, regular donations really do make a difference to Dyscover’s future. This can be done either on-line or in person. Please read more about this new scheme for supporters. To donate on-line please click here. was successfully launched in 2017 to encourage supporters to make regular donations to help us meet essential costs, enabling services and activities to continue at Dyscover. Securing unrestricted funds is a major challenge for small, local charities like us, as we need to cover salaries and administrative costs in order to deliver our regular sessions and programme of activities. Just over 24% of the total cost of delivering regular support comes from membership and session costs, so the remainder has to be raised through voluntary income – and this is where the Dyscover Champions scheme can make a real difference. The donation form is available here. or from the Office at Dyscover. Please email Julia jbaker@dyscover.org.uk for more information and further details about Dyscover Champions, or for help with completing the form. Make a donation using your credit or debit card through CAF on-line. To donate on-line please click here. To donate by post, simply complete our donation form and post to us. To donate through justgiving please click here. Giving a gift in memory of a loved one, or instead of flowers at a funeral, is a positive way to celebrate and honour a life. Leaving a legacy will ensure that your money lives on and makes a real difference to people in need. No matter how large or small, your donation will help us to continue our work and expand our services. Please click here to view our information postcard or click here for our downloadable codicil form. Celebrating a special birthday or an anniversary? Supporting Dyscover at your special occasion is a rewarding and thoughtful way to help us support people with aphasia. You can ask guests to make a donation instead of giving you a gift at your wedding, birthday, wedding anniversary or at any other celebration. What is payroll giving? Costs you less to give more! When you set up a payroll giving donation, the amount you pledge is taken from your salary before tax is deducted. So if you pledge £10, as a basic rate taxpayer, you will only actually pay £8 (this is as little as £5 if you pay higher-rate tax). As a result your donation costs you less, but gives Dyscover more. To show their commitment to the scheme, many employers offer a matched giving scheme, so the amount you donate could be worth double, or even triple what you pledge. From boosting employee morale and raising your organisation’s profile, to enhancing community involvement programmes, payroll giving is good for business. Payroll Giving is quick and easy to set-up and administer, it is a great way for businesses to demonstrate commitment to the causes that their employees care about. To find out more visit The Payroll Giving Centre. Walk, run, cycle, swim or hold a coffee morning on our behalf. Click here to email us and ask for ideas and advice. Set up your own page on justgiving.com and choose Dyscover from the list of potential charities to support. By ticking the Gift Aid box on our donation form or in the on-line options, every donation you make is worth more to Dyscover. If you are a UK taxpayer, for every £1 you give, the Government will add 25p from your taxes. Simply tick the gift aid box on your donation form or fill in a Gift Aid form.